You can support the library with items you have around the house! The wish tree is a list of items the library is looking for to help with events, office work and more. If you are considering getting rid of any of the items below we ask that you consider donating them to the library first. Come check out our physical wish tree at the library as well! To view an up to date listing of library wish list check out our Amazon wish list. If you wish to purchase an item for the library feel free to purchase it through any store of your choosing. If you have an item that is on this wish list already that you would like to donate we will happily accept it as well. 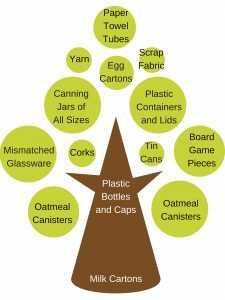 We are also looking for common items you might already be throwing out or recycling for crafts. Check out the tree below for what we are collecting at the moment.